Alongside physicians, residents get hands-on medical instruction at MAFP Spring Fling. 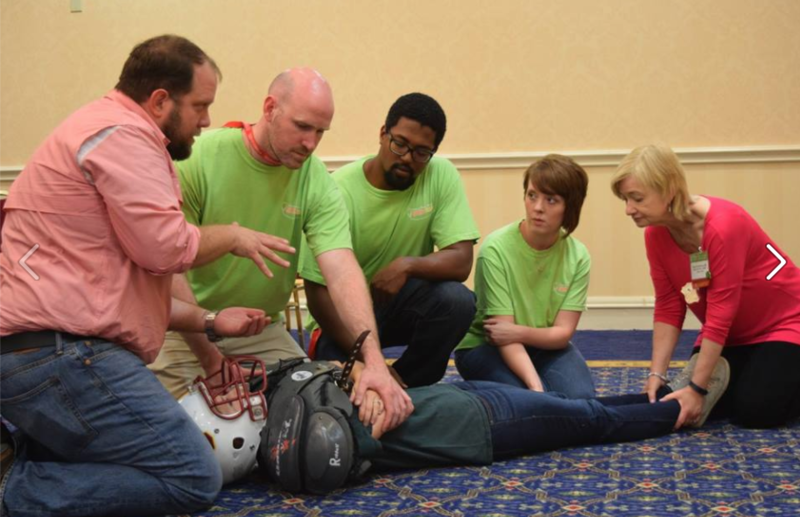 Here, P. Brent Smith, MD, left, teaches residents how to immobilize a possible spinal injury. Resident membership in the MAFP represents an important step in your career. It signifies your decision to identify and associate with the most knowledgeable physicians in an organization dedicated to advancing and representing the specialty of Family Medicine. The Mississippi Academy of Family Physicians is here to support you through residency, as a new physician, and throughout your Family Medicine career. Through conferences, scholarships, and other opportunities, the MAFP helps Family Medicine residents access the resources they need to make their future practices great. As a member of the MAFP, residents have the opportunity to participate in MAFP activities, network with the family physician community, and receive MAFP publications. In addition, leadership opportunities exist to get involved in the MAFP and the American Academy of Family Physicians through service on the board of directors, and commissions, committees, and forums. By being an Academy leader, you will have a voice and vote on key issues affecting the Family Medicine specialty. The MAFP and MAFP Foundation both provide opportunities for the future leaders of family medicine to enhance their education, make connections and gain “real world” experience. Both organizations seek dynamic medical students (4) and residents (4) to serve a 1-year term on the Board of Directors for each organization. Interested students and residents should complete a 2019 Student and Resident Board Application (due March 30, 2019) and review 2019 Student and Resident Board Campaign Rules. The Board of Directors Application and additional required documents must received at MAFP at a predetermined deadline in the Spring. Elections for these board members takes place at the Spring Fling. The Future in Family Medicine Spring Fling is held each April specifically for medical students and residents. The conference features procedures, practice topics, panel discussion and the opportunity to network with practicing Mississippi family physicians. Find more information on our Spring Fling page. Family Medicine Resident National Leadership Positions – Residents can serve in American Academy of Family Physicians leadership positions for a 1-year-term, many beginning in the fall. Some positions are elected and some are appointed. Are you a resident looking for a way to support your idea that addresses an unmet health care need of underserved patients in your community? The Family Medicine Cares Resident Service Award for $16,500 allows first- and second-year Family Medicine residents to design and implement resourceful service projects that address unmet health care needs of the underserved in their local communities. AAFP chooses 30 students and residents to participate in year-long leadership training which includes scholarship money, attendance at AAFP National Conference, a family physician mentor and more. Deadline for applications is March 1. Please visit one of our four Mississippi’s Family Medicine Residency Programs to learn more about the clinical experience, academic programs and contact information.